Search for "label/words of wisdom" - Who Said Nothing in Life is Free? Collin at Hip2Save posted this and I thought it would be a great addition to my Wednesday Words of Wisdom section. This should help you figure out how much to stockpile. �Sell-By� date: Tells the store how long to display the product for sale. Be sure to buy the product BEFORE the date expires. �Best if Used By (or Before)� date: Recommended for best flavor or quality. It is NOT a purchase or safety date. �Use-By� date: Last date recommended for the use of the product while at peak quality as determined by the manufacturer of the product. If stored around 37 degrees Fahrenheit, pasteurized milk will remain fresh for 2-5 days after its sell-by date. All meat (whether it�s ground hamburger or a steak) should be eaten or placed in the freezer within 2 days of purchase. Even if the sell-by date is five days away, the refrigerator at home usually isn�t cool enough to keep the meat fresh for more than two days. Frozen ground meat should be used within 3 months. Pork holds for 6 months. Beef, lamb, veal, and venison last 8 to 12 months in the freezer. Chicken should be cooked or frozen within 2 days of purchase. Poultry and other birds last about 12 months in the freezer. Do NOT that chicken on the kitchen counter as bacteria multiply very rapidly at room temperature. The safest way to thaw poultry or meat is to defrost it by placing the package in the refrigerator immediately after removing it from the freezer or by placing the package under cold running water. Be sure to store them below 75 degrees Fahrenheit. In general, high-acid canned foods such as tomatoes, grapefruit and pineapple can be stored on the shelf 12 to 18 months; low-acid canned foods such as meat, poultry, fish and most vegetables will keep 2 to 5 years. Edible 2-3 months after being opened in a dry room. Eat within three to four days of opening. Last up to three weeks and can also be frozen up to six months. Properly refrigerated and handled, eggs are considered safe for consumption for four to five weeks beyond the sell-by date. Did you know that you should refrigerate the eggs in their original carton and place them in the coldest part of the refrigerator, not in the door?! 2 to 3 years, particularly if it�s in a pump container. Check the package for an expiration date. About two years if you stash it away in a cool, dark place. Wednesday Words of Wisdom – What is the Date of This Insert??? On the side of each coupon insert, printed in tiny print, is the date of the insert and what paper it came out of. 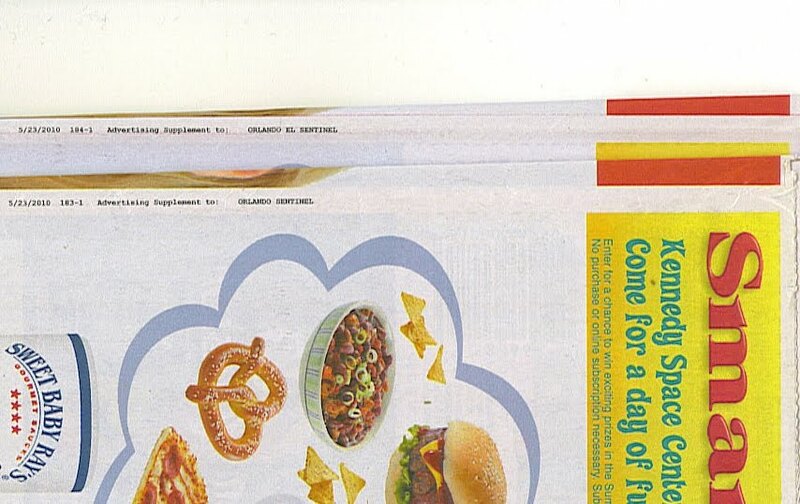 Looking at the 2 inserts I scanned, one was from the Orlando El Setinel and the other was from the Orlando Sentinel. They both came out on 5/23. **Knowing what paper I got the insert out of helps me a lot when there is a coupon that was only in the Orlando Sentinel and not in the El Sentinel or vise versa. Since I posted about how great “rewards programs” are as my Wednesday Words of Wisdom, I thought I would give away 30 coke points which is enough to cash out for a coupon for a FREE 20 oz Coke product or a FREE Powerade or a FREE Dasani water. GO HERE to read all my posts from my Wednesday Words of Wisdom!!! This is a great set of posts for beginning couponers. Every Wednesday I do a new post which will be added to this page!